The below eBook uses the Flipbooks software; a system in which the IDC Manuals can be viewed online. Selecting the right and left arrows on the eBook turns the page. Double clicking a specific section of the page zooms in. Drag the scroll button on the bottom of the page to move quickly between the entire eBook. 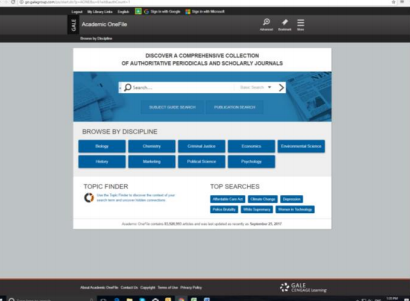 Gale Academic OneFile, provides millions of articles from over 17,000 scholarly journals and other authoritative sources. Academic OneFile also offers abstracts and full text articles covering subjects such as biology, chemistry, criminal justice, economics, environmental science, history, marketing, political science, and psychology, in both PDF and HTML formats. more than 11,000 peer-reviewed journals and more than 8,000 in full text. open URL compliance for access to e-journal and subscription materials, allowing users to save and share URLs. full text of The New York Times from 1985 to present, updated daily. major reference sets including Gale Encyclopedia of Science and Encyclopedia of World Biography. full-text articles from periodicals covered in major bibliographic resources such as CINAHL, BIOSIS, MLA, PsycINFO, ERIC, EconLit, RILM, and others. thousands of podcasts and transcripts from NPR and CNN. Elsevier abstracts from 1996 to present. full text of The Times and Financial Times. Click here to view the GALE Academic OneFile library access instructions. Welcome to the GALE Academic OneFile Library. 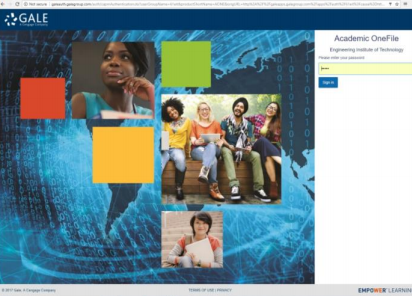 As an EIT Student, you have access to the GALE Academic OneFile Library which contains high quality full text and abstract academic articles in electronic format, covering hundreds of topics in nine disciplines. Then Browse by discipline, or search by title, subject or publication. EIT has access to Knovel! 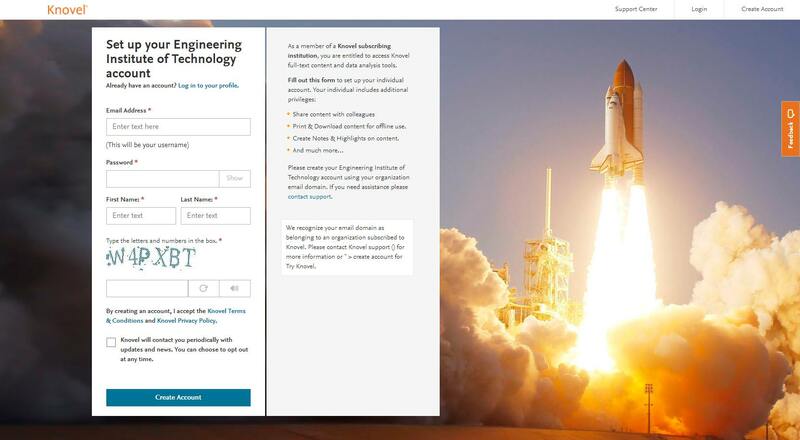 Knovel is a trusted resource for hundreds of thousands of professors, researchers and students at top engineering schools worldwide for Chemical, Mechanical, Aeronautical, and Manufacturing Engineering. Get general reference and best practice insights, process and design applications, material and substance properties data, and equations for specific engineering disciplines. Knovel’s interactive equations and graphs put you in charge of data, letting you quickly and easily solve problems. Please enter your own email address (this will be used as your username to access the library), register a password, your first name and surname to set up. This will set up your Knovel user account to access the library from now on. PLEASE REGISTER ONLY ONCE. Once you have created your own account please login as below. Once registered, you can now access your Elsevier Knovel Library directly using this link. See below for a screenshot. To Login from this page, click ‘Welcome Guest’ in the top right hand corner, and login using the username and password that you just registered. Check out a quick tutorial video to find out how our interactive tools help with initial calculations, engineering-focused and data search features, mobile capabilities and integrations with engineering software and applications. Visit Knovel today to find out how our trusted resources can help take your studies to the next level. How to register for Knovel. These two minute videos illustrate how to get the most out of your Knovel acess, including how to conduct a basic search, datasearch, and how to access plugins and use interactive tools such as equations. Knovel has a list of Frequently Asked Questions at this location. EIT has access to IEEE! 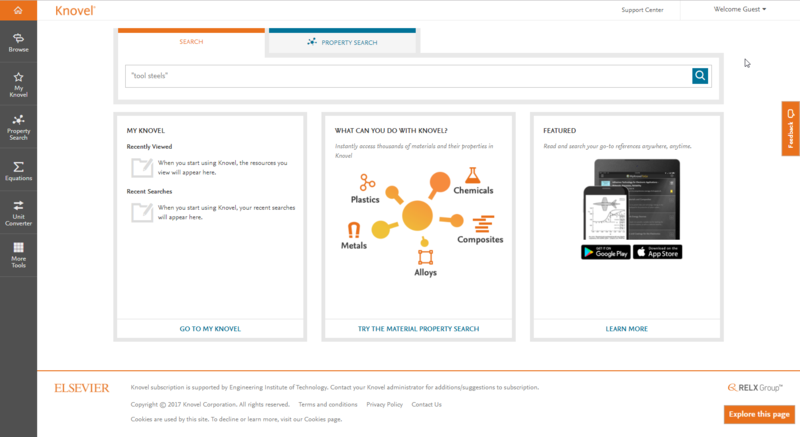 IEEE Xplore is a digital library providing access to the world's highest quality technical literature in electrical engineering, computer science, electronics, and related disciplines. IEEE Xplore contains full-text documents from IEEE journals, magazines, conference proceedings, and standards, in addition to eBooks and educational courses. IEEE Xplore also includes content from other select publishers including the Institution of Engineering and Technology (IET), MIT Press, IBM, Nokia Bell Labs, VDE Verlag, Morgan & Claypool, Tsinghua University Press, American Geophysical Union (AGU), and Beijing Institute of Aerospace Information (BIAI). These videos demonstrate how to get the most out of your IEEE access. IEEE has a list of Frequently Asked Questions at this location. This eLibrary provides access to over 160 technical manuals published by IDC Technologies, which can be downloaded (below) or viewed online here. The manuals cover a range of disciplines including mechanical, electrical, civil and chemical engineering as well as instrumentation, automation and process control, data communications and networking. Several of the manuals available in this collection were developed in line with EIT programs to meet specific needs and niche topics.